Corporates are relying on network services provided by intelligent network growing every day. The flexibility of simultaneously transporting data, voice and video and the ability to rapidly deploy new business applications are key factors in employee productivity and business success. Now you can connect employees, partners and customers together with live, interactive audio, data, and video conferencing. Use IP phones, mobile phones, laptops, or desktops, all with integrated instant messaging (IM) and email, for online collaboration. It´s your fast path to high efficiency and productivity. Using WebEx, everyone gains the value of participating in live meetings without travel, and the savings are impressive. 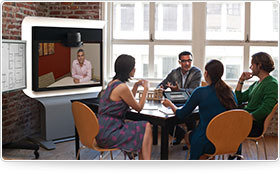 Deliver live meetings across the campus or around the world. Offer powerful online collaboration tools that accelerate idea sharing and product development. Optimize productivity by giving employees instant access to easy communications. Train, educate, and inform large audiences all at once.